Friday 26th - Saturday 27th July 2019 . This year a refundable Litter Bond (£3) will be added to all camping tickets. This will be refunded when you produce one full bag of waste or recycling to the Litter Bond Deposit Point along with your Litter Bond ticket. The Litter Bond can be exchanged for a drink at the bar (value £4.50) or refunded in cash (face value). As Part of our Love the Land scheme, we wish to do our upmost to leave the farm clean and tidy so the animals can go back to their home as quickly as possible. More information on collecting your litter and returning your bond will be published in early 2019. Weekend entry from 10am Friday. Teens must be accompanied by a parent or guardian over the age of 18 at all times whilst at the festival. One adult over 18 can supervise a maximum of 4 under 18's. Each teen ticket holder will be given a special wristband, with space to write their guardian's name and phone number. Teens must be accompanied by a parent or guardian over the age of 18 at all times whilst at the festival. One adult over 18 can supervise a maximum of 4 under 18's. Each teen ticket holder will be given a special wristband, with space to write their guardian's name and phone number. Discounted weekend value ticket for 2 x adults and 2 x 13 - 17 years. A separate family camping area is available, no booking required. Access for one caravan or campervan to the campervan and caravan camping field, towing vehicles are to be returned to the general car park. Each caravan or campervan is allowed one accompanying small tent. Entry for a live-in vehicle to the festival. Needs to be used in conjunction with a separate festival ticket for entry. A Thursday entry ticket for weekend customers allows you to camp from Thursday in the standard campsite, live-in vehicle field or in your pre-pitched tent. Thursday tickets are only valid in conjunction with a Full Weekend ticket and allow entry to the festival campsites from Thursday 25th July 2019. Thursday tickets upgrade your Campervan Pass tickets you might purchase to be available from Thursday. Our campsites, car parks and box office open at 4PM on the Thursday for those with an extra Thursday ticket with entertainment from 6PM until 11pm. One Way ticket from Bruton train station to Farmfest. You cannot walk from Bruton station to the site as the road leading up has no pavement and is very dangerous. Return ticket from Bruton train station to Farmfest. You cannot walk from Bruton station to the site as the road leading up has no pavement and is very dangerous. and must be accompanied by a parent or guardian at all times. Under 12s are free but need to be registered. Each child ticket holder will be given a special wristband, with space to write their guardian's name and phone number. For 13 years Farmfest has been carefully crafted into one of the most unique and inclusive smallscale gatherings in the UK, where music and people set the tempo and the curious venture. 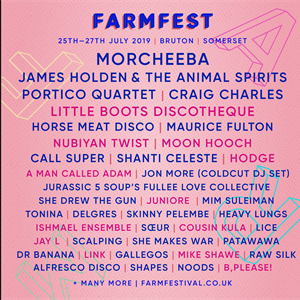 Set to a sumptuous Somerset backdrop, our pocket-sized field builds a swirling musical orchestra with performances from some of the finest emerging and established left-of-mainstream artists, operating within the realms of electronic, indie, folk and world, but where genre meets no border. From early morning workouts to kids' workshops, or brilliantly blended beats to riotous jumbles of jazz and brass-based bonanzas, comedy and poetry - or just a touch of the people's spirited madness - you can come find your groove. Home to more than seven music venues, plus a host of other spaces and delights for the whole family, it's a consciously capped 5000 people capacity for the whole weekend, and a bubbling blend of unfettered festival frolics and humming party vigour. Back for 2019, it's still run by a collective of friends, with and for the local community as an independent, non-corporate and sponsor free event, and one that gives back to charities close to our hearts. Set at a price that's to help and not hinder, Farmfest is for the time out we all seek. So kick back, cut loose - and come play. 2019's line up will be coming soon!